All the seeds needed for a better future are already here: so many people and organisations are doing outstanding work to shape the future of this country and change our impact on the planet. What is missing to reach a tipping point for collective transformation? Often, we tend to work in silos, or even compete despite sharing a common goal and intention. We know that our biggest societal challenges can only be solved when actors from all sectors come together and yet we struggle to collaborate even at a small scale. Our history is one of working together across religions, divides and language barriers. We believe that Switzerland is in a unique position to build on our cultural heritage of dialogue and collaboration to create the future we want to live in, together. When we develop the needed skills and attitudes to cooperate and learn how to see all our individual efforts from a perspective of the whole, we really unlock the potential of an ecosystem. Only then will we be able to truly shape the country’s future collectively and proactively in a way that is life affirming for everyone, including nature and the future generations. Our mission is to catalyse and cultivate the conditions for collaboration in Switzerland towards the Sustainable Development Goals (SDGs). We believe in a collaborative, innovative and sustainable Switzerland and are here to support organisations and individuals who work towards its realisation. The biggest challenges of our time can only be solved collectively. This is why we invite people to join spaces for open and deep dialogue, to develop regenerative solutions that will transform individuals, organisations and systems. We build structures and design processes that allow resources and talents, otherwise confined within organisations, to flow towards impact. We cultivate a creative community of practice empowered to work as a field rather as singular cells. Our community is one of individuals and organisations that have recognised the need for a profound transformation in Switzerland, and who each hold a unique contribution to this process. Some are leaders in theirs fields, pioneers who hold a deep calling question, whilst others are practitioners, focus on collaborating and contributing to various endeavours or have a general calling towards our vision and are with us on a learning journey. Deepen your contribution to the future of Switzerland and find moral, human and practical support for your work. Benefit from our network and the many talents and ideas our community harbors. Support each other’s projects, find new ways of making the best ideas a reality, unlock new possibilities to collaborate and create more impact thanks to the learnings and connections. Develop your skills and capacity, attend trainings, learn about new forms and tools of collaboration and dialogue by being part of our community of practice. 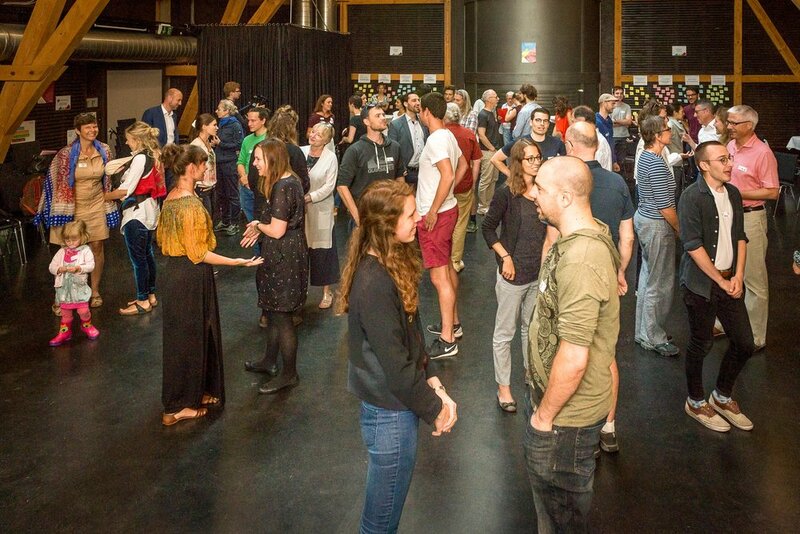 Broaden your horizon of activity and get involved in the Social Labs, join existing or new projects, attend or host Dialogue Evenings, deliver services with us and become active in the ecosystem..
Focus on co-evolving as individuals and as a collective. Therefore we create the spaces and flows to be an alive, agile and learning ecosystem. Sounds interesting? So if you harbour a burning question, would love to contribute to the co-creation of the Switzerland we want to live in and want to go on an expedition with us, find out more about how to get involved in our community. This project is possible thanks to the support of Stiftung 3FO.